ResoNations was an international telematic music concert for peace November 21, 2009 performed by twenty-six renowned musicians in five international locations: United Nations Headquarters in New York, University of California San Diego, The Banff Centre in Alberta, Canada, Queens University Belfast, and Dongguk University in Seoul with support from the Korean Advanced Institute of Science and Technology (KAIST). Telematic music is real-time performance via the internet by musicians in different geographic locations. Four new contemporary music works for peace were performed by the composite ensemble: Hope’s Dream by Mark Dresser and Sarah Weaver, Disparate Bodies by Pedro Rebelo, Rock, Paper, Scissors by Chris Chafe, and Green-colored Harmony by Jun Kim. The performance took place on high-bandwidth internet with JackTrip audio software developed by Chris Chafe and Access Grid video software developed at Argonne National Laboratory. There were audiences in each location and a world-wide webcast. ResoNations was part of the annual Innovation Talks Symposia held at the United Nations Headquarters New York by World Association of Former United Nations Interns and Fellows (WAFUNIF), a United Nations Peace Messenger. WAFUNIF Arts For Peace and the Permanent Mission of Romania to the United Nations sponsored the event. Arts for Peace has also worked with artists Mark Dresser and Sarah Weaver as a sponsor of Deep Tones for Peace, another recent telematic music project, and looks forward to further opportunities to support the work of the United Nations through telematic music and technology. Dean Sally Blount, Leonard N. Stern School of Business, Undergraduate College, Advisor to the President and Provost for Global Integration, New York University. Online Audience Participation: Multimedia Art Research Centres and Electronic Laboratories (MARCEL) is a permanent high band-width network dedicated to artistic, educational and cultural experimentation, exchange between art and science and collaboration between art and industry with 150 members in 22 countries. The panel will take place in the MARCEL Access Grid virtual venue and the general public is encouraged to be an audience as well as participate in the Q&A. 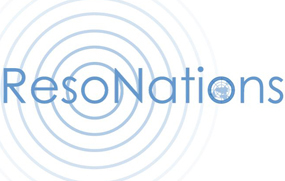 For Full Listing of ResoNations 2009 Musicians, Technologists, and Further Information, View the ResoNations Website.